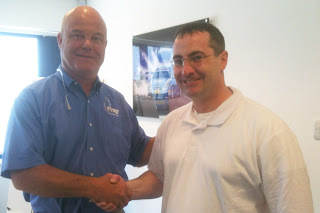 This is Craig Sommerfeld, a really nice guy from Iowa who had a great idea and followed it through. in 1986 Craig was building some kitchen units for his home and needed a better way of securing his face frames to the units than using nails and filler. 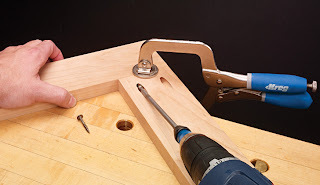 Being a tool and die maker, he fashioned himself a J shaped piece of aluminium with an angled steel tubular insert so that he could accurately and repeatably drill shallow diagonal 'pocket holes' to accept screws inserted from the inside of the cabinet. And so Craig's Jig - later to become the Kreg Jig, was born. 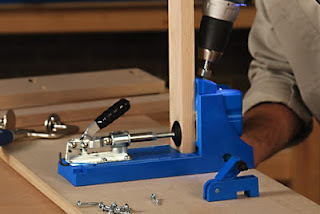 The plastic bits are actually glass reinforced nylon and are virtually indestructible, the frame can be clamped or screwed to a bench for producing components (as shown above) or you can use the integral clamp to fix it directly to the workpiece. 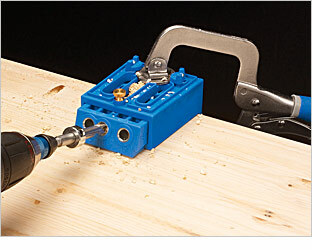 For situations where you need to take the jig to the workpiece and space is limited (repair work for example) the drill guide block can be removed and installed in a Kreg portable base unit, which locates over the side of the workpiece and can be adjusted for material thickness by sliding the guide block in or out and securing it with the brass screw. All Kreg products are solid, durable and robust, a result of the guy who invented the system and owns the company standing in front of his customers and selling it to them week in week out for years. The system is simple, fast, accurate and works beautifully. Whether you are making your first table and find traditional joinery a bit daunting, or a top designer-maker looking to improve the speed and efficiency of producing jigs and forms, Kreg pocket hole joinery may just be the answer. For those that want more discrete pocket holes there is the Kreg Micro guide block, which simply replaces the guide block in the standard set up and produces 25% smaller pocket holes. Using the pan head screws the head of the screw is still fully concealed and the holes are plugable. Does anyone know why they moved away from the lever in the front which was on the K3 system and back to the front which was a return to the K2000 type jig? Hi Don, I think there was a copyright dispute about it, not sure of the details but I believe the case was thrown out in the end.